Dangers: Carolina geraniums are NOT edible but are only used externally medicinally in wounds and gargles, do not swallow. 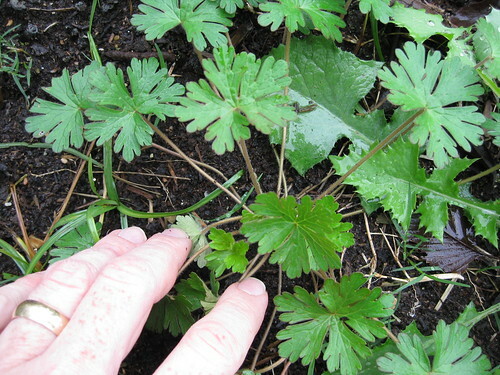 Carolina geranium seedling in December. Getting bigger. Note the lobed leaves with rounded teeth, and how the stems are hairy. 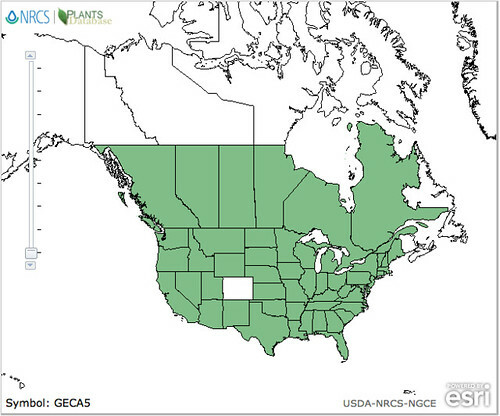 Mature Carolina geraniums can spread over 24 inches across. 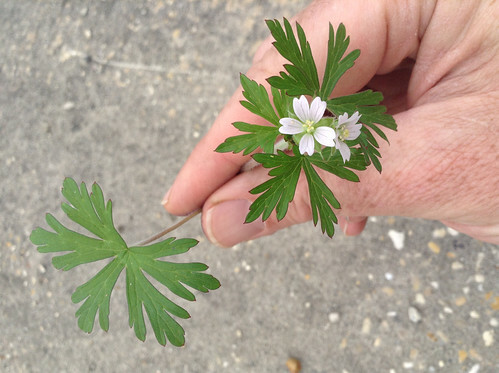 Carolina geranium flowers have five petals, each with a rounded notch at the tip. Close-up of Carolina geranium seed pods. 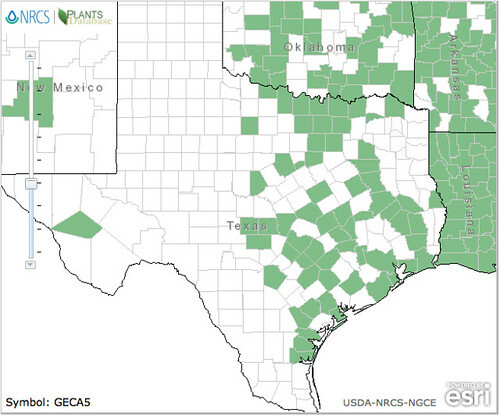 Many a yard, flowerbed and garden see this low, creeping weed show up in the Texas "winter". Left unpacked, it'll turn into a leggy, small bush around one foot tall and two feet across. 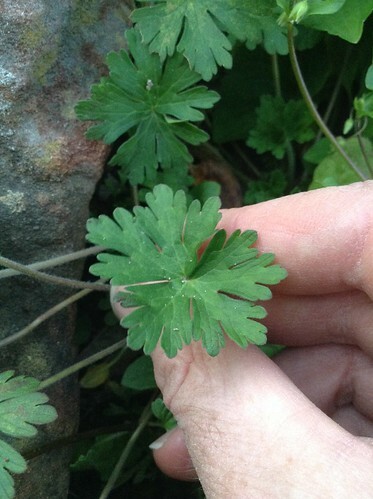 The leaves are deeply lobed with rounded, toothed edges. Stems are hairy. The pink flowers eventually turn into a long, pointed seedpod thingy. The plant grows outwards from a single taproot and that taproot is the medicinal part that you'll want. The bigger the aboveground plant the bigger this root so put off harvesting it as long as possible. The root of Carolina geranium is very astringent which makes it excellent for stopping bleeding. Astringent compounds cause capillaries to constrict, thereby shutting down minor bleeding. If you're spraying arterial blood or have a deep slash through several medium-to-large veins you're out of luck. Think nosebleed level of bleeding or smaller. These astringent molecules will also give some relief to a sore throat if gargled but don't swallow the decoction made from the root. After a minute of swishing/gargling spit it out. Too use this root, simply pull it out of the ground and rub/rip away the small, side roots from the main taproot. You can use it fresh if you chop it up really finely then boil 1-2 teaspoons full in 1 cup water for ten minutes. My lawyer says I need to remind people to let this solution cool before using. Native Americans would dry the root, grind it into a fine powder, then sprinkle this powder into wounds to stop bleeding. Personally, I've never tried this powdered root method but hey, it might be good to know when the zombies come. 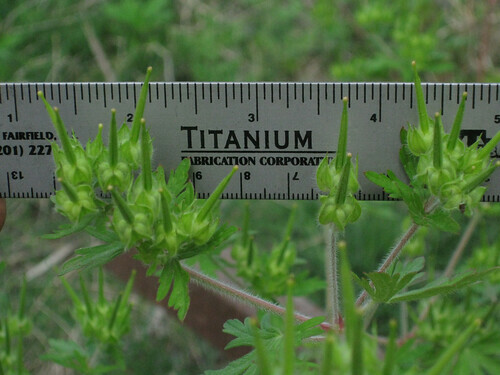 Two mimics of this plant are the poisonous Creeping Buttercup (Ranunculus repens) and edible Carolina Bristle Mallow (Modiola caroliniana). Poisonous mimic Creeping Buttercup (Ranunculus repens). 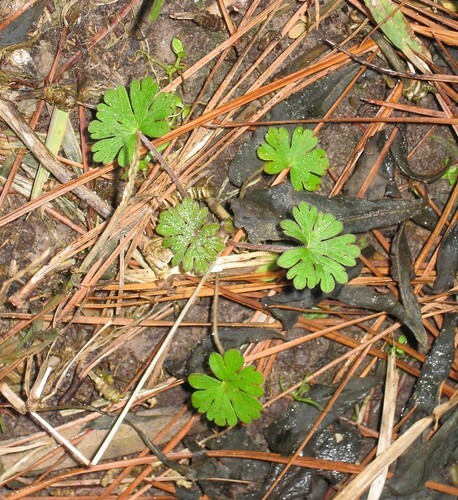 You can see the leaves of the creeping buttercup are much less deeply lobed, shinier, and smoother. 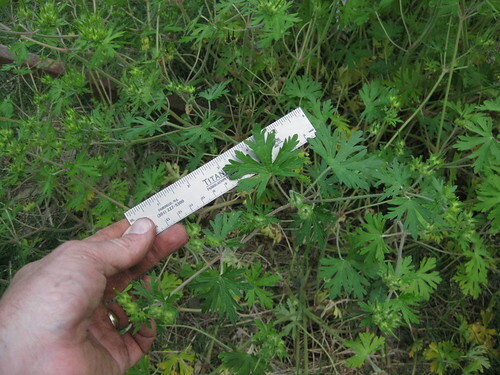 The stems are smooth and the entire plant hugs the ground more closely than Carolina geraniums. Creeping buttercups contain a chemical that, when consumed, makes mammals hypersensitive to sunlight. 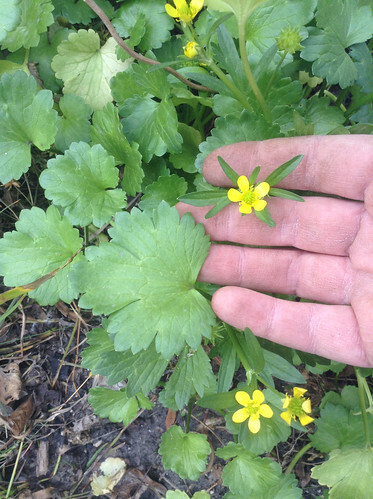 Skin hit by sunlight almost immediately starts to blister...basically, creeping buttercups turn you into a redhead! Edible Carolina Bristle Mallow (Modiola caroliniana). 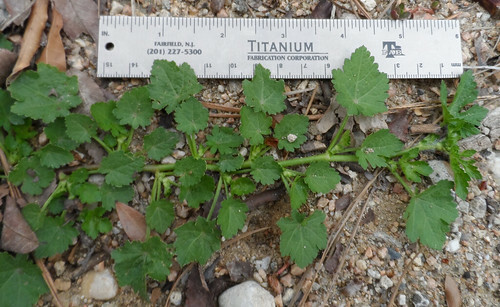 Carolina bristle mallow has very coarse leaves and stems. It creeps along the ground and puts down roots wherever the stem touches the ground. It is used to make a cooling tea.